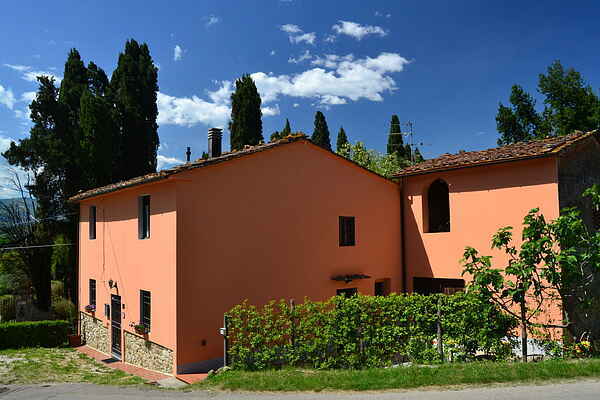 The house is located in the countryside, a scenic region suitable for walking, even if it is only 3 km from the center of Pistoia, a beautiful but little-known Tuscan town rich in history and monuments that is definitely one-day visit. The house is in a central location to visit the north of Tuscany, especially at a distance of one hour or less drive are: Florence and its art treasures, Pisa with the Square of Miracles and the Leaning Tower, Montecatini and Monsummano with spas and thermal caves (20 minutes), the high Tosco Emiliano with its beautiful mountains equipped for winter sports and for trips of hiking and mountain biking in the summer. Guests of the Casa dei Tarocchi can use the swimming pool of a nearby hotel and benefit from a 50% discount on the entrance fee of € 10.00 on weekdays and € 12.00 on weekends, while children pay € 8. The pool is very big. The maximum depth is 1.70 m. It is equipped with all services (changing rooms, showers, lifeguard, etc.). It has a beautiful panoramic location. In addition, there is a restaurant and a bar that also prepare cold dishes (salads, etc.). Guests can rent beds and umbrellas for an additional fee. The beautiful city of Lucca (30 min) wrapped in its feature walls and Versilia with its famous sandy beaches of Viareggio and Forte dei Marmi (50 min) are easily reached since the house is located just 5 minutes from exit Pistoia of the A11 Firenze-Mare There's also a horseriding school not far from the house with several routes to try and see the zone. For the people who are coming in July, definately go to Pistoia Blues! A Music Festival with different concerts all around town.